At this meeting we will be discussing strategies to address vacant properties including demolition, stabilization (saving intact historic properties in anticipation of future rehabilitation) and greening. An important tool for implementing these strategies will be Project Creating Opportunities for Renewal and Enterprise – or Project C.O.R.E. In January 2016, Governor Larry Hogan and Mayor Stephanie Rawlings-Blake announced a four-year partnership between the Maryland Department of Housing and Community Development, the Maryland Stadium Authority, and the Baltimore City Department of Housing and Community Development to demolish thousands of vacant buildings to serve as the catalyst for redevelopment, reinvestment, and stabilization in Baltimore. Under Project C.O.R.E., the State has committed to invest $75 million and the City has committed to contribute $18.5 million to demolish as many blighted properties as possible over four years, focusing on half- and whole-blocks of blight in order to maximize neighborhood impact. 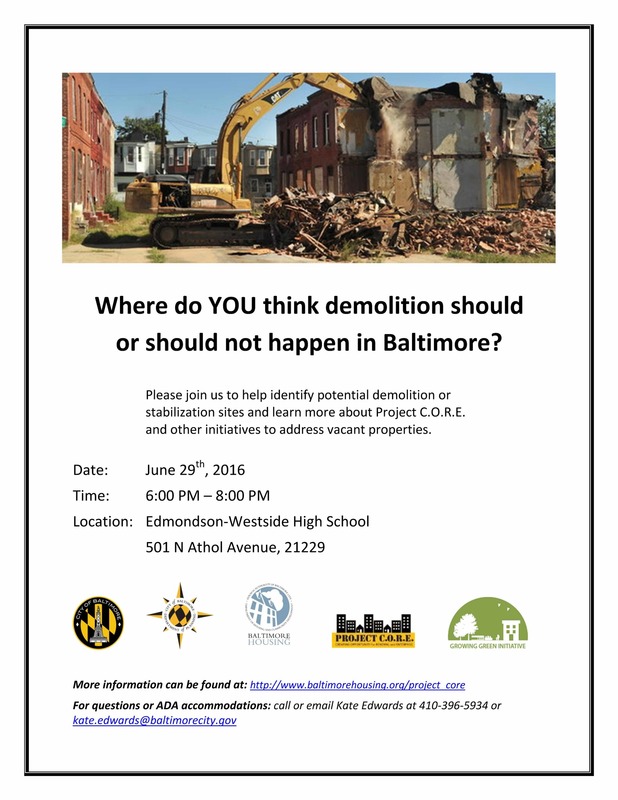 We need your input on where demolition and stabilization should or should not occur in Baltimore. If you have questions, please feel free to contact Kate Edwards at kate.edwards@baltimorecity.gov or 410.396.5934.